I am very delayed in writing and posting this. My friend Shannon and I went to Wild Rosemary for dinner about 3 weeks ago and I’m just getting to writing this. There goes the new years promise to be better at writing timely reviews! Once again, my personal life has gotten in the way of things. I’ve wanted to go to the tiny (and I mean tiny) BYOB Wild Rosemary for ages. This place is next to impossible to get a reservation at. They only have about 8-10 tables, maybe they seat 30 people at a time and this is a place that people tend to linger. Also, people tend to make standing reservations (like every first Friday). So I made my late January, Wednesday night reservation back in November. However, it it well worth the wait. 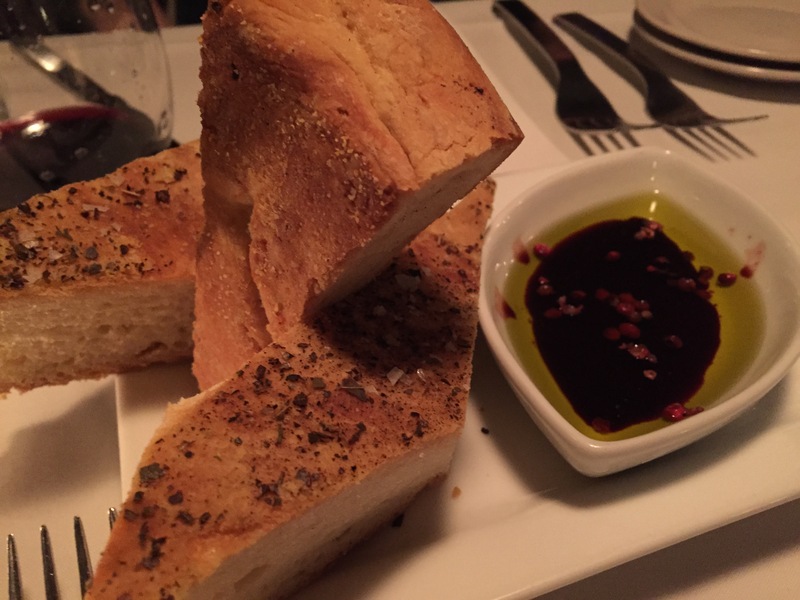 First they brought us out this fabulous focaccia bread that was seasoned and served with an olive oil and pomegranate balsamic (if I remember correctly that’s what it was). I was starving and pretty much devoured one piece immediately. They only offered one appetizer. They were just shrimp with homemade cocktail sauce. But these shrimp were like the size of a newborns arm. I’m not kidding. It was good to have something little to start with! We both ordered something off the menu that is not offered all the time. 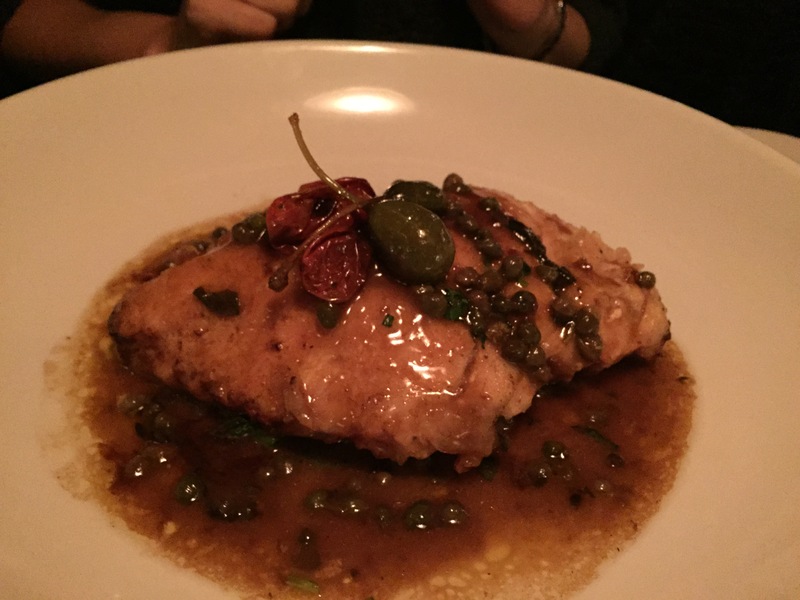 Shannon ordered a chicken that was served with a fantastic caper sauce. It was both pretty and delicious. And, bonus, both capers and caper berries are good for you! 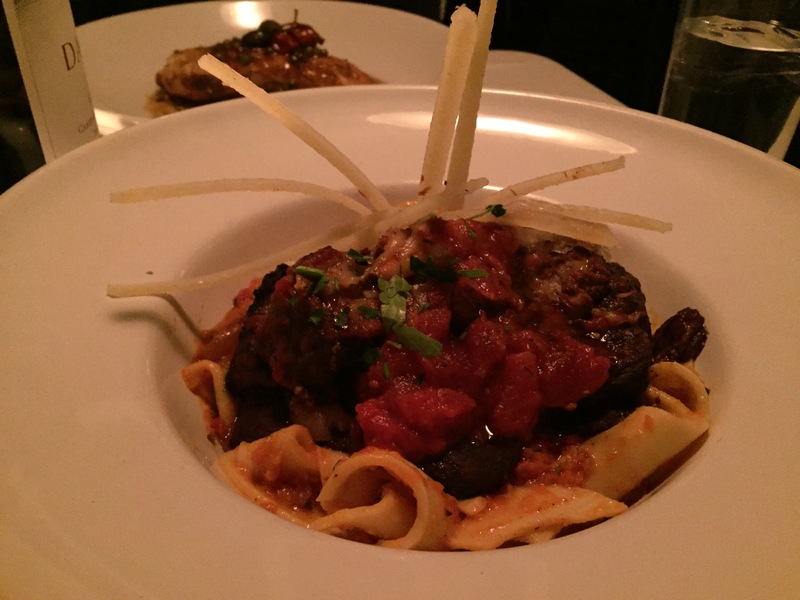 I went with a less healthy but equally delicious option of veal short ribs and homemade pappardelle pasta from Fede (local pasta makers) and sticks of Parmesan cheese. Again, this was as pretty as it was delicious. The braised short ribs literally melted in my mouth. This was easily one of the best meals I’ve ever had. I loved the red wine tomato sauce that the meat was braised in. It served as the pasta sauce as well and was simple and delicious. We had finished our bottle of wine at this point, but of course had to try something for dessert. This was the only thing I was a little disappointed in. 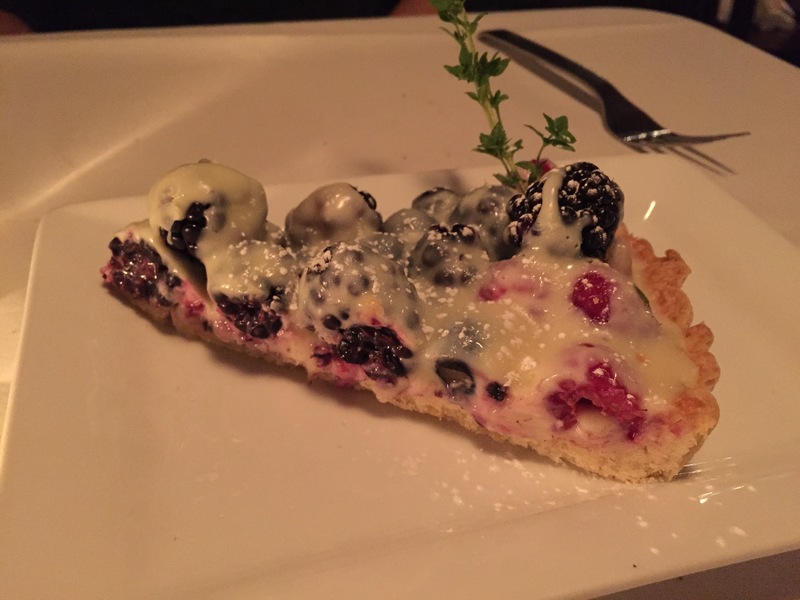 We got a berry tarte with white chocolate drizzle and it was cold and rather dry. I assume it was served cold on purpose, but the tart shell was really dry. With a dinner that good though, I won’t complain about not being in love with dessert! Overall, I would absolutely go back here. It was not cheap though, so I’d reserve this for a special occasion meal I think!